There are certainly delights to be found in How to Stop Time, despite its tendency to oversimplify. 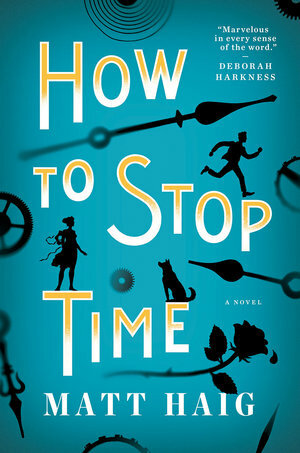 Perhaps it's a case of hindsight informing an opinion after the fact, but as soon as I read that How to Stop Time had already been optioned for a movie (set to star Benedict Cumberbatch of Sherlock fame) before the novel hit shelves, it occurred to me that the pacing of Matt Haig's newest novel reminded me of a screenplay more than a novel. The sharp jumps back and forth through time—the current-day actions neatly cut through with relevant flashbacks that amplify their poignance—practically slot themselves into your brain as visual media. That's not a knock on How to Stop Time, but perhaps it does explain my lingering dissatisfaction with the thin mythos of the novel and the too-quick wrap-up at the end. There are certainly delights to be found in How to Stop Time, despite its tendency to oversimplify. The story is intriguing even if it never quite fully rises to its potential. Our narrator and protagonist is Tom Hazard, a high school teacher in present-day London, whose secret is that he was actually born 439 years prior and ages extremely slowly—almost unnoticeably, and is resistant to illness and disease. At a certain point during his adolescence, people started to notice that Tom didn't age, which led to his mother being tried and drowned as a witch in rural England. He has spent nearly his entire life on the run, afraid to stay in any one place for too long, allowing him to work both as a musician for Shakespeare and play piano in a Paris bar during the Gilded Age, but robbing him of the opportunity to make a home. Fortunately, at the turn of the 20th century, the Albatross Society—named for the belief that albatrosses live a long time—steps in, offering him a deal. If he works to recruit people like them—namely, people who have lived for centuries while barely aging—the Society, with its infinite resources, will help him choose whatever life he wants every eight years (eight years being a reasonable amount of time before people start getting suspicious). After all, scientists and organizations around the world with unknown motives would surely want to get their hands on Albatrosses to discover the secret of their survival, putting them in mortal danger if they were to reveal the truth—not to mention the more analog dangers of villagers thirsting to hunt witches, or doctors thinking they're witnessing madness. As its mysterious leader Hendrich (for the record: Anthony Hopkins would nail this role) tells Tom early on, "the first rule is that you don't fall in love" with "mayflies", as the Albatross calls ordinary people who don't have their condition. Tom can have any material pleasure he so desires, but love is off the table—"because otherwise you will slowly lose your mind." Tom did fall in love once—unwisely, as he tries to convince himself even to this day—when he was working with Shakespeare, and lost his love, Rose, to plague. However, their daughter Marion, who inherited Tom's gift-curse, survived, and has been missing for centuries. So while Tom is teaching history in London in the 2010's, he waits for the Albatross Society to find her, as Hendrich promised him to sweeten the deal, trying to freeze his emotions and heart in amber. The prospect of outliving everyone you love is undoubtedly horrifying, yet, in a disappointing aspect of the narrative, Tom hasn't had to suffer through it, since his mother was murdered and his wife died of plague. He never had to see wither away with age even as he wondered when he would grow his first gray hair. As a result, Haig has almost undermined the gravity of the rule against falling in love, because we haven't had to see Tom go through the pain of loss by degree. His day-to-day life is a delicate ballet of not accidentally revealing too much first-hand knowledge of the history he teaches to his students and avoiding his attraction to Camille, the school's French teacher (appearing in my mind as Mélanie Laurent, in case you're curious). Thus we have the flashbacks that, again, will translate marvelously to the screen—Tom talks about Shakespeare's plays, only for the narrative to cut to when Tom actually knew Shakespeare, providing character backstory and details for the reader before cutting (the abruptness of the flashbacks is really best described in these film terms) back to Tom's lesson. The prose is strong and occasionally excellent, and there are some lovely quirks that allow the reader to experience, in some part, the strangeness of existing through centuries of change and development. In Tom's retelling, a window in a room in the 16th century is the same size as the portable television Tom used in Brazil in 1980: it's a neat rhetorical trick that allows us to enjoy the brief anachronism of something in the past being compared to something that doesn't yet exist, because of how it's slotted into Tom's memory. Tom's wit, developed over the course of centuries, is also delightful in his flashbacks and contemporary thoughts. The hindsight Tom has gained over the centuries allows him to be fairly blasé about the inevitable coming apocalypses screamed about in comments sections, as he says: "this is the chief comfort of being four hundred and thirty-nine ears old. You understand quite completely that the main lesson of history is: humans don't learn from history." When the conversation with Zelda and F. Scott Fitzgerald gets a little too close for comfort—they express a desire to never grow old, ironically enough—Tom recalls that he "sighed, hoping this would make me appear thoughtful and serious in and in possession of a great Golden Age intelligence." Living through the so-called Roaring Twenties prompts Tom's intriguing comparisons of all of the Londons he's known—the "bellowing 1630s" and the "laughing 1750s"—with a similar anachronistic charm to his window-television comparison. It may be stating the obvious, but since no one has actually lived through multiple centuries, these observations about how 1750 differs from 1920 feel utterly fresh and vital. Only in a work of fiction or in a history textbook can we see these decades and centuries judged against one another and contextualized through the sweep of history; it's apt, therefore, that Tom feels the need to make history come alive for his students, since he's basically a living textbook. Even if his students can't literally live through the centuries as he has, Tom has seen enough of the world and its incredible seismic shifts to know that understanding history is important, even if to avoid repeating the mistakes of the past. With so much thematic material to dig into, How to Stop Time ultimately gives its subject and its world short shrift. I would come back for a sequel or two that really delves into the Albatross Society's machinations, establishes Hendrich's and Agnes's characters as more than plot devices, and really gets into the nuts and bolts of how these Albatrosses can stand being uprooted every eight years for brand-new lives, all in the name of survival. The potential for social media and ever-present state surveillance to completely destroy the Albatross Society by unraveling the members' alibis is only hinted at when Tom starts to use Facebook. It's certainly entertaining to read about Tom stumbling into the realms of beloved famous individuals simply by virtue of being alive for centuries, but it strikes me as a failure to completely craft the world in which Tom, Hendrich, and everyone else lives—and how anonymity and escape are pretty much impossible in the 21st century. Again, screenplays aren't as long as novels, and the world-building in the eventual film will likely use visual shortcuts (such as teasing shots of security or traffic cameras) to help establish that the Albatrosses are essentially living on borrowed time in the present day. In fact, it's as if Matt Haig didn't want to address the details of how, exactly, being a near-immortal would work now that cameras that are now ever-present, as well as the infinite stream of information we as 21st-century denizens consume on a daily basis, and so he just chose to focus mostly on the charming flashbacks to Tom rubbing elbows with Shakespeare and the Fitzgeralds.